11. The Drawing & Disbursing Officer of the Department of Pension & Pensioners’ Welfare is authorized to draw the amount as mentioned in Col 5 of Table given in para 11 above for disbursement to the Grantee Pensioners Association by way of transferring the amount to the Bank Accounts of respective Pensioners’ Associations. 12.The expenditure involved is debitable to Major Head “2070”- Other Administrative Services 00.800. 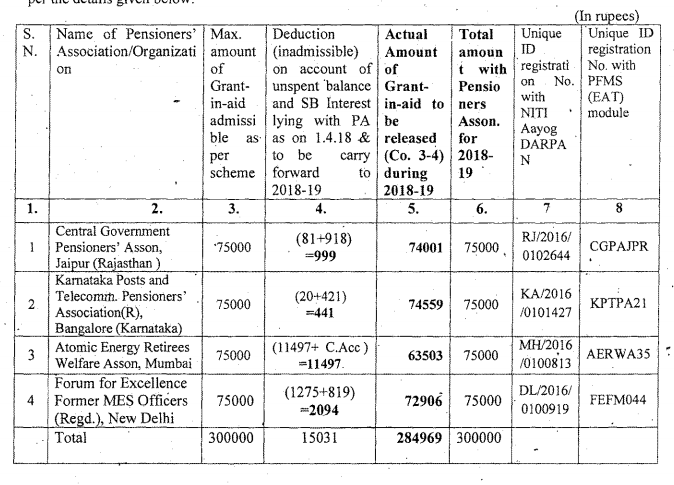 Other Expenditure, ( Minor Head); 43- Plan Scheme of Department of Pensions and Pensioner Welfare, 43.01 Pensioners Portal; 43.01.31 – Grants-in-Aid-General under Demand No.- 70 Ministry of Personnel, Public Grievances & Pensions for the year 2018 19. 13. The accounts of the above Pensioners Associations shall be Open to inspection by the sanctioning authority-and the audit, both by the Comptroller and Auditor -General of the India under the provision of CAG (DPC) Act, 1971 and internal audit by the Principal Accounts Officer of the Department of Pension & Pensioners’ Welfare, whenever the organization is called upon to do so.